Saturday, October 17, 2015. Two of the best pitchers in baseball, Matt Harvey and Jon Lester, faced off against each other in a highly-anticipated Game 1 of the 2015 NLCS. Harvey fired 7.2 brilliant innings, fanning nine Cubs batters and only allowing two runs on four hits. Lester didn’t pitch as well, going only six innings and allowing four runs. The Mets beat the Cubs by a score of 4-2, en route to an eventual four-game sweep of the Cubs and their first trip to the World Series in 15 years. Wednesday, September 13, 2017. Two diminished pitchers, Matt Harvey and Jon Lester, faced off against each other in a game that was only meaningful to one of the two teams on the field. 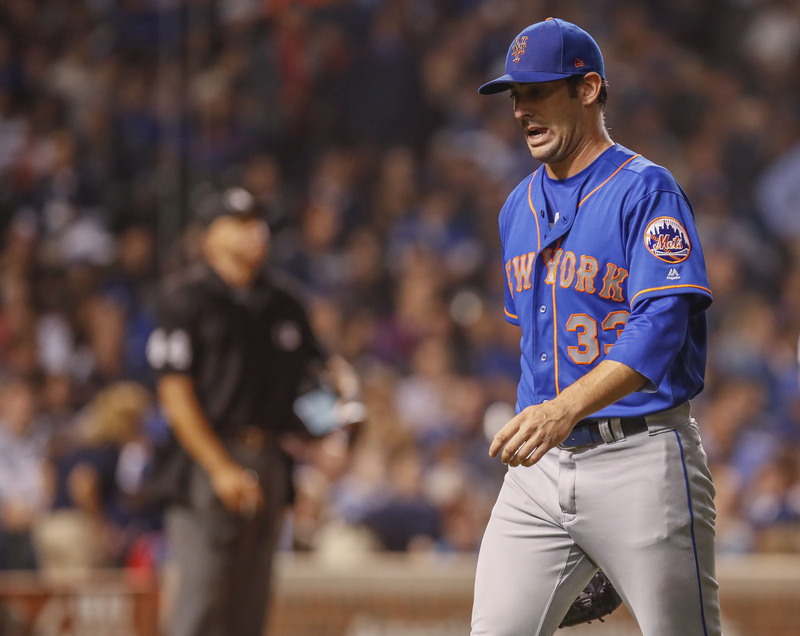 Harvey got roughed up for five runs on seven hits and four walks in just 3.1 innings. Lester pitched better, going six innings and allowing two runs. The Cubs completely humiliated the Mets by a score of 17-5, en route to what looks like an imminent division championship and their third-straight playoff appearance. Mazel tov to them. For Harvey, he has now allowed five or more runs in six of his starts this year. He allowed five or more runs in five starts over the course of 2012 to 2015. His ERA on the season now 6.14. To be fair, Harvey at least looked to have some of his stuff back at times in the outing, and Hansel Robles actually gave up three of his five earned runs. Harvey was popping the mitt at 95-96 a couple times, and spun some decent breaking pitches. Of course, the results were not there, though that means less at this point in the season. On offense, the Mets had some early chances against Jon Lester. Jose Reyes led off the game with a home run, and in the second inning, Harvey laid down a nice safety squeeze to score Amed Rosario from third. But they left two men on base in that second inning, and then left two more runners on in the third, and then were pretty much stifled for the next few innings. The Cubs were already leading 5-2 by the end of the fourth. They pushed across another run in the sixth inning on an Asdrubal Cabrera error, and then scored four more runs in the seventh off homers by Javier Baez and Alberto Almora Jr. to make it 10-2 and completely blow the game open. But the Mets answered back with three of their own in the top of the eighth, two of them coming on Dom Smith’s sixth home run of the season to put his line at .207/.252/.405 for the year, which is just odd. So the score was 10-5 after the top of the eighth inning. It was 17-5 after the bottom of the eighth inning. I don’t really feel I need to recap exactly what happened to the Mets’ bullpen in that disastrous eighth inning. Just watch this video and you’ll get the picture. Jacob Rhame was charged with five runs, as he looks thoroughly unready for the big leagues. Jamie Callahan actually gave up some of those runs as inherited runners, but was only charged with two runs himself. The Mets bullpen needs some work, folks. There are some encouraging tidbits we can try pull out of the debris here, though. Rosario had three more hits last night; he continues to quietly come into his own at the MLB level. His speed is also proving its value, as he scored on that afforementioned safety squeeze. In addition, Kevin Plawecki batted cleanup, because sure why not, and walked three times to raise his OPS to .726, because sure why not. Losing 17-5 is bad enough. Losing 17-5 in a game that takes three hours and 42 minutes to play is even worse. The Braves have hired former Mets front-office member Adam Fisher to be their assistant GM. Fisher had been in the Mets’ front office since 2003. The Mets apparently have no plans to non-tender Matt Harvey this offseason. The Mets will try to not get humiliated in their series finale against the Cubs. Seth Lugo takes the mound for the Mets against Jen-Ho Tseng for the Cubs, who will be making his MLB debut. First pitch is at 8:05 p.m.